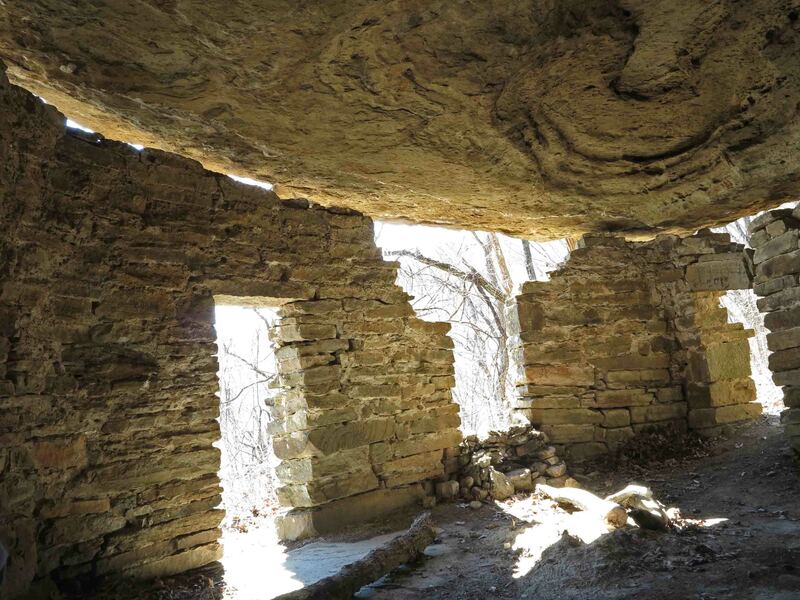 The Rock House is one of my favorite landmarks on the Ozark Highlands Trail (OHT). It’s easily accessed, but most drive Highway 23 unaware of the history perched under a bluff a mere quarter mile walk from the road. As the crow flies, the distance is much closer and during the winter it’s easy to see the highway down below. Don’t let the roundtrip 0.5-mile by trail deceive you. 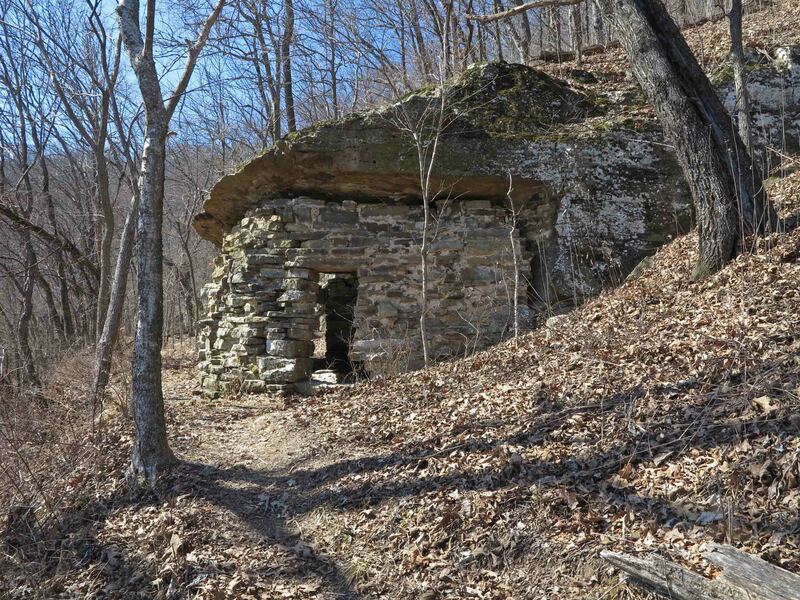 It’s a steep climb on the Ozark Highlands Trail and a short spur trail to the structure. If you walk to see Rock House, wear sturdy walking shoes and carry some water. The Rock House was probably built as a shelter for loggers sometime during the 1890s to 1920s when the area was heavily logged for white oak, in high demand because of the expansion of railroads across the country. By the 1930s, the old-growth forests were pretty much exhausted. It still makes a good shelter today in spite of some shifting of the ground that has caused a separation between the wall and bluff. It has a rough concrete floor, and a small spring located in the back of the single room. The short hike to Rock House begins at Cherry Bend Trail Head, located approximately five miles north of Cass on AR 23 (AKA Pig Trail). This is a popular trailhead for accessing the OHT. Watch for fast traffic when crossing the highway as you begin your walk. A spur trail leads to a nice view behind the trailhead sign, but to access the OHT and Rock House, you’ll cross the highway on a short trail marked with blue blazes. There is a thru-hike trail register at the intersection with the OHT. We’re going to turn left onto the OHT and head sharply uphill following white blazes. 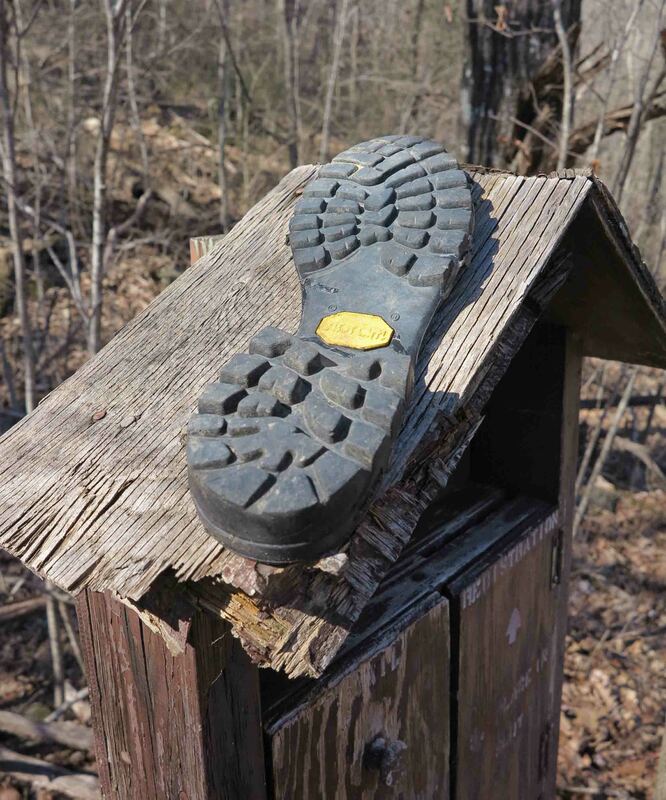 I only saw one “lost sole” on my hike up to Rock House. You’ll often have the OHT all to yourself, but you might encounter thru-hikers and enjoy a short visit about their time on the trail. 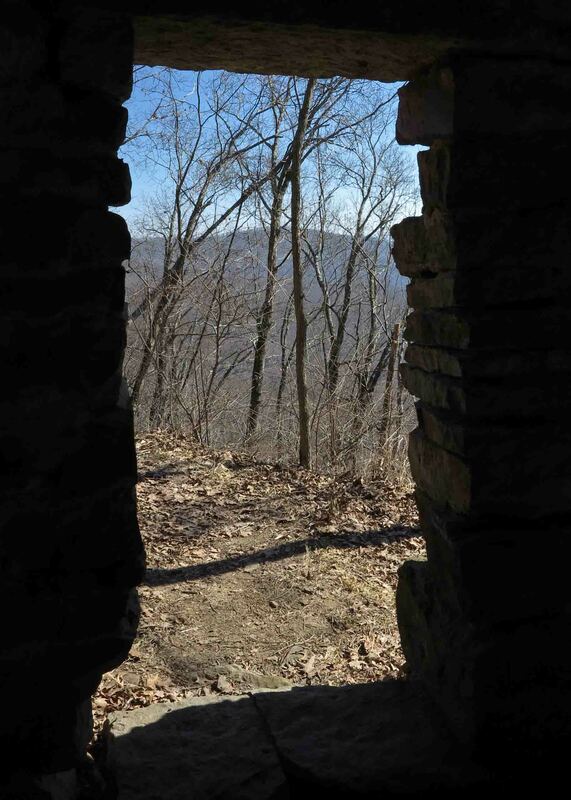 On a thru-hike of the Ozark Highlands Trail in December of 2013, a hiking buddy and I spent a cold night in the Rock House sheltered from the rain. Seeing car lights below made me want to rush down and beg someone to bring pizza from Clarksville, but staying warm in my sleeping bag won that short mental argument. Today as I revisit the Rock House, it’s sunny and mild for February. The views of the Ozark Mountains to the east are enticing. I feel the desire to load my pack and head out for a multi-day hike over Hare Mountain and through the Marinoni Scenic Area to Lick Branch. Hiker attempted to drink from the spring in the back corner but the water was a couple of feet below the edge, and she didn’t couldn’t reach it. The water from this spring needs to be filtered. The single time I filtered water here, it wasn’t the best. It would be good water if you’re in a bind or have time to filter it through cloth before using your water filter. You can see the toll that time has taken. The separation of the rock walls from the bluff ceiling are evident as well as the loose rocks around doors and windows. Please leave this fragile structure as you find it. 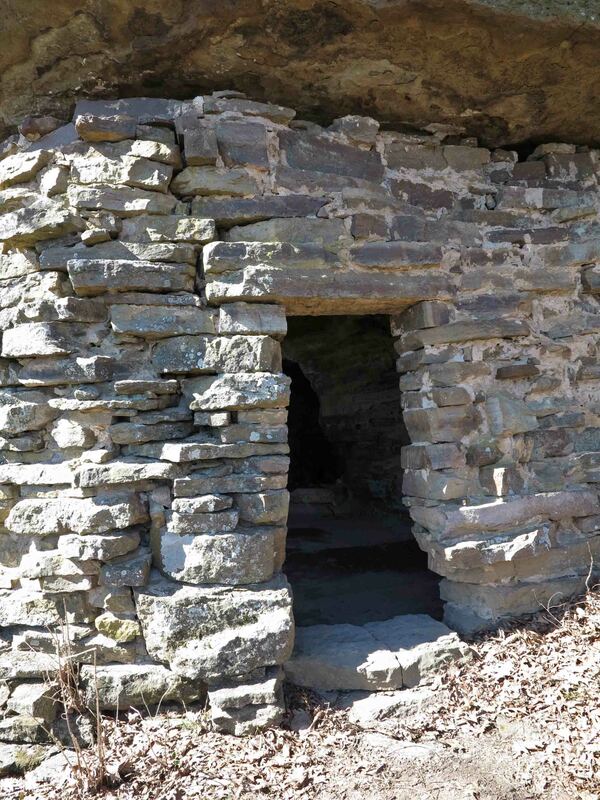 The Rock House is a little historic treasure we’ll want our children and grandchildren to see for years to come! 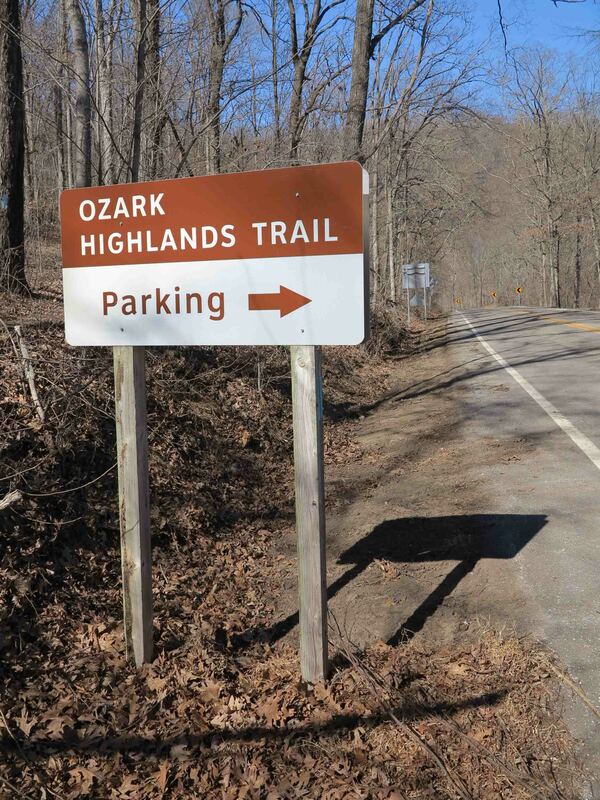 Note: I’ve enjoyed sharing a glimpse of the rich history surrounding the Ozark Highlands Trail. If you know of other structures in the Arkansas or Missouri Ozarks, please share them with me on my feedback page or comment on this post. 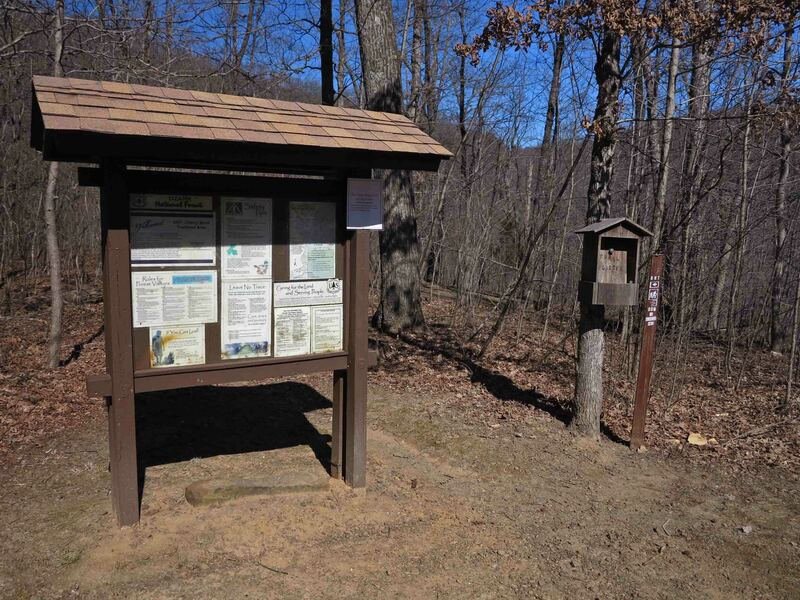 Cherry Bend Trailhead is located approximately 5 miles north of Cass on Arkansas Highway 23. 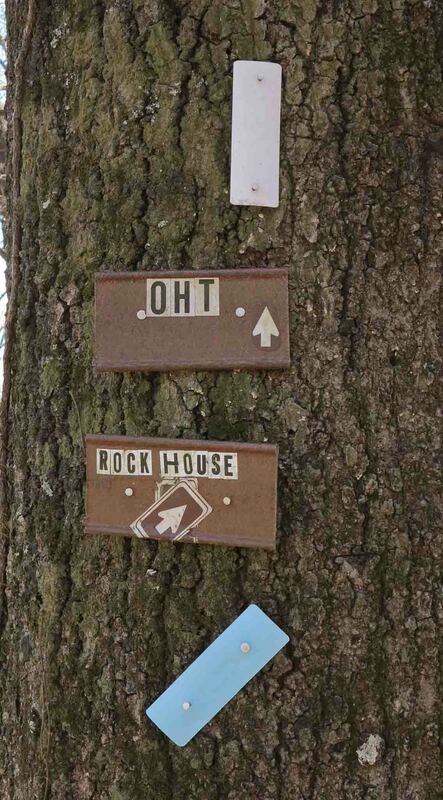 The second waypoint on the above map is the intersection with the OHT. The OHT route showing on this web map is an approximation. The last waypoint on the east side of Highway 23 is the Rock House. 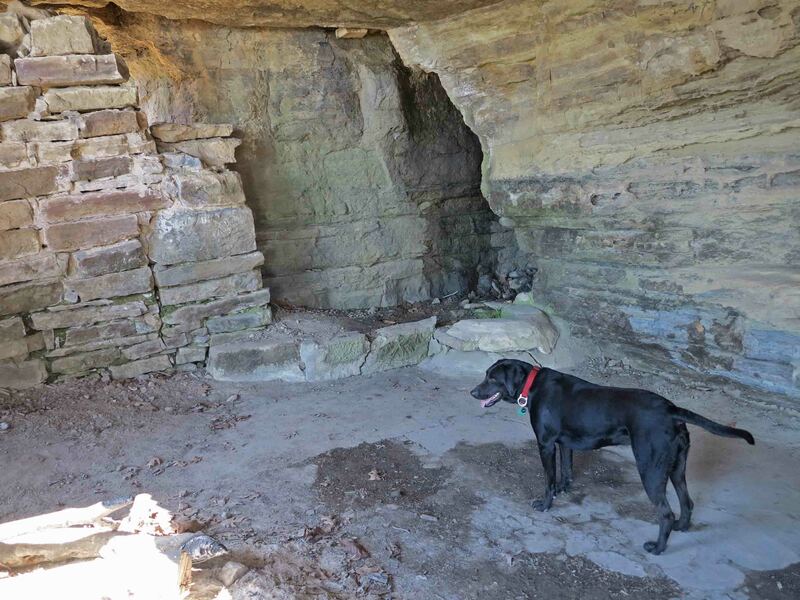 This entry was tagged Cherry Bend Trailhead, day hike, dayhike, Hiker-dog, historic structures, Lick Branch Trailhead, logging, Marinoni Scenic Area, OHT, Ozark Highlands Trail, Rock House, white oak. Bookmark the permalink. My great grandfather James F. Owen used this place as a cabin in the 1920s-30s. He was a Methodist minister with a circuit in the area. I need to research the topic further and obtain a complete history. My guess is that James received the property from the HB Owen Tie Co — his brother’s company in Algoma, MS– and the property was later sold (or taken) for the highway. When I was a kid in the 1970s, my grandfather, James (Pug) F. Owen, Jr., would lead the family up to the house occasionally. Pug was a game warden in Franklin County. Thank you for the interesting info. Fascinating to hear the story of your great grandfather! I also appreciate the railroad tie company name. how cool. i thru hiked the oht this past december 2017 and on my 4th day i reached the shelter just before dark. it was the only day it rained the entire time and i got to the shelter 20 minutes after it started. i wasnt even trying too, i just happened to get there at that perfect time. i then sat up for a few hours and watched the lighting and rain outside and listened to the thunder while i tended a small fire that lit up the walls brilliantly. played my mini guitar and sipped hot cider. best night ive ever had camping in my life. just wanted to share that with you. Thanks for sharing with me. Mother said sometimes they could see storms with lightning below in the valley. Such a shame that our government can’t see the need to preserve this wonderful place. What an interesting note of history! 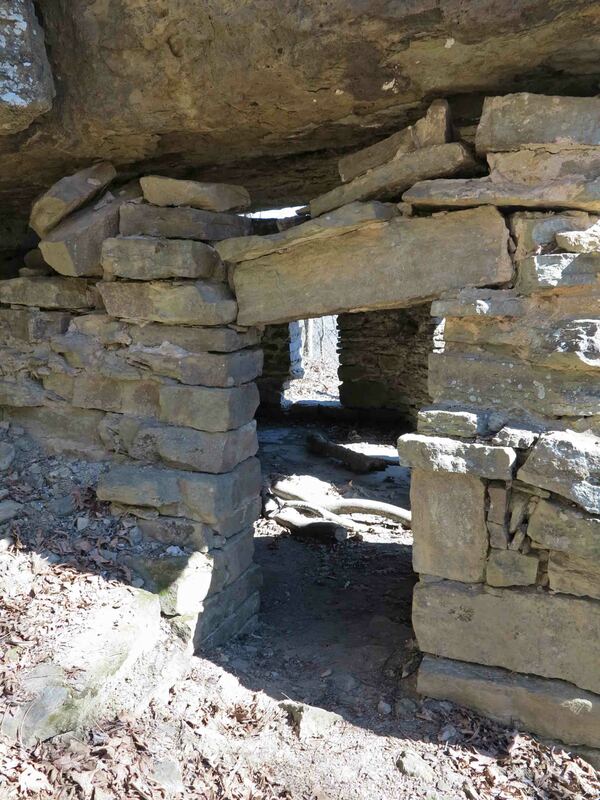 I have hiked into the Rock house a few times and wondered who might have constructed it. Thank you for the wonderful photos and for sharing your hikes with your readers. The OHT is truly a treasure! Laughed when I read that you almost bailed out for a pizza in Clarksville. Dennis Heter and our group did just that years ago but from Oark (i think) camp in the pouring rain. Good Post. I will check it out. Thanks. In the past, when I’ve driven to White Rock, going in I usually take hwy 23. I can’t believe I didn’t know about this. It reminds me of many of the ancient Indian dwellings out west. I think you’ll find him on Facebook. This is my first visit to this site and was directed here by a friend. Very impressed with the site. i live at Cass on Fanes Creek and am proud of my family’s connection to the Cass area. I also want to state that the correct spelling is Fain as recorded on early deeds and government maps. All children of J. F. Owen are deceased and the grandchildren are getting on in age, so I want to record the following while my mind and memory is still good. Granddaddy built the Rock House ( in the early 1900’s) when he marked timber for his brother Hardy B. Owen, who apparently had some of the timber rights to this area. Hardy was very wealthy and his life is written in the history of Mississippi. The spring flowed in at the corner and into a rock and concrete basin which drained into a hole in the floor close to the basin. The rock shelf was used to store clothes and household items. it’s hard to imagine that the mountains were home to many families at this time and before. Much of the land was farmed which accounts for the many rock fences and graveyards in the mountains. The children would visit and stay with their father in the summer and pick the wild fruits in the mountains. They would visit the falls located down the hill on West Mountain Creek. The pool below the falls was described as “bottomless” and abundant with fish. I know the pool has a bottom as I have been there, but that is another funny story. There was a rope swing above the house and the children would swing out over the front. The road at the time was located up the mountain from the house but I have not tried to locate the old road. Uncle Hardy would drive his car there and walk down to the house. When the children would be with him, they said they pushed the car as much as rode, probably why their uncle took them along. Stella rode a horse from town in the night to inform her father of the birth of Bobby Gene. Granddaddy sat down on a rock to rest one day and sat on a rattlesnake. He killed the snake, but said he regretted doing so since the snake didn’t bite him. I feel the structure should be recognized as historic and preserved by our government as it has deteriorated a lot since my first visit. In the meantime, I hope all who visit will leave it as found.